In August, we announced a new partnership with the American Studies Association (ASA), which promotes the development and dissemination of interdisciplinary research on U.S. culture and history in a global context. We are excited to welcome more American Studies classes into our Classroom Program through this partnership. We also announced a new partnership with the National Communication Association (NCA), which advances Communications as a discipline that studies all forms, modes, media, and consequences of communication through humanistic, social scientific, and aesthetic inquiry. 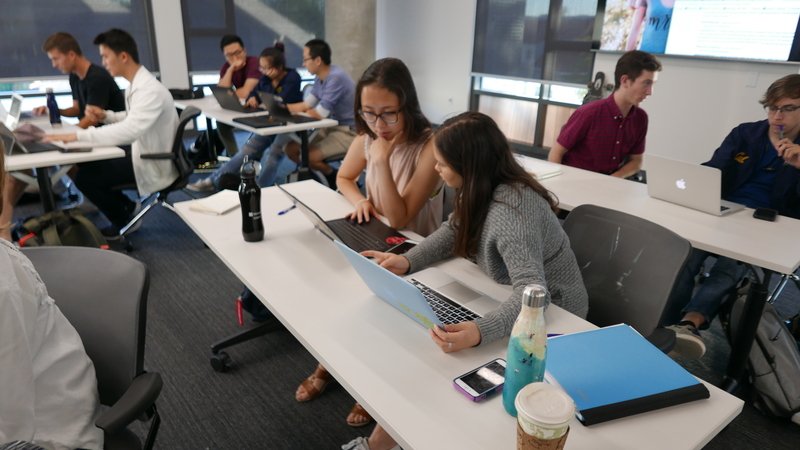 Communication Studies students have been improving Wikipedia through our Classroom Program for many years, and we’re thrilled to see more growth in this content area due to this partnership. We placed a new Visiting Scholar with the Deep Carbon Observatory (DCO). Andrew Newell, who in his day job is an Associate Research Professor in the Marine, Earth, and Atmospheric Sciences department at North Carolina State University, specializing in rock magnetism, will be developing Wikipedia’s coverage of topics relevant to deep carbon science in his role as Visiting Scholar. There have been many notable contributions to Wikipedia by Visiting Scholars this month. But George Mason University Visiting Scholar Gary Greenbaum’s three promotions to featured article (his work on the Waterloo Medal, William Henry Harrison’s 1840 presidential campaign, and the British florin) in a single month is especially remarkable. Product Manager Sage Ross has developed a new tool for measuring quality, not just quantity, of impact of student work on Wikipedia. Article development data, or what we call ‘structural completeness’, can be plotted at the scale of thousands of articles at once. As a result, the Dashboard now has a tool that enables Wiki Education staff to build graphs of the impact of entire terms. Jami speaks with a potential instructor at the American Political Science Association conference. Early in the month, Educational Partnerships Manager Jami Mathewson, Outreach Manager Samantha Weald, and Classroom Program Manager Helaine Blumenthal attended the American Political Science Association conference here in San Francisco. We spent the week discussing the massive gap between what experts know and what the public understands about political science. So many experts research important, interesting topics about governments and political behavior, yet the information can be difficult to understand if you haven’t spent a career devoted to it. That’s where Wikipedia—and assignments that enable political science students to share distilled knowledge there—comes in. We’re excited to continue working with even more political science professors in our programs. UC Berkeley students edit Wikipedia. Samantha visited the University of California, Berkeley and joined faculty at the American Cultures Center, a center committed to fostering academic excellence and civic engagement around issues critical to America’s dynamic ethnic, racial, and sociocultural landscape. The American Cultures Center has a set of engaged scholarship courses that take the study of important issues outside of the classroom, aiming to provide opportunities for students to participate in collaborative social justice projects alongside community organizations like Wiki Education. At the workshop, Samantha met with instructors teaching in global studies, cultural anthropology, environmental design, and bioengineering among others, with courses primed and ready to participate in the Classroom Program. Jami returned to Washington, D.C. to meet with academic association staff and encourage new Wikipedia initiatives they can use to engage their members in public scholarship. While in town, she joined faculty at Howard University’s Center for Excellence in Teaching, Learning, and Assessment (CETLA) to run a Wikipedia workshop, and Wiki Education looks forward to future collaborations with the center and instructors in attendance. We’re thrilled to announce two new partnerships this month. We will begin a Wikipedia initiative with the American Studies Association (ASA), an organization promoting the development and dissemination of interdisciplinary research on U.S. culture and history in a global context. We are launching a new partnership with the National Communication Association (NCA), an organization advancing Communication as the discipline that studies all forms, modes, media, and consequences of communication through humanistic, social scientific, and aesthetic inquiry. 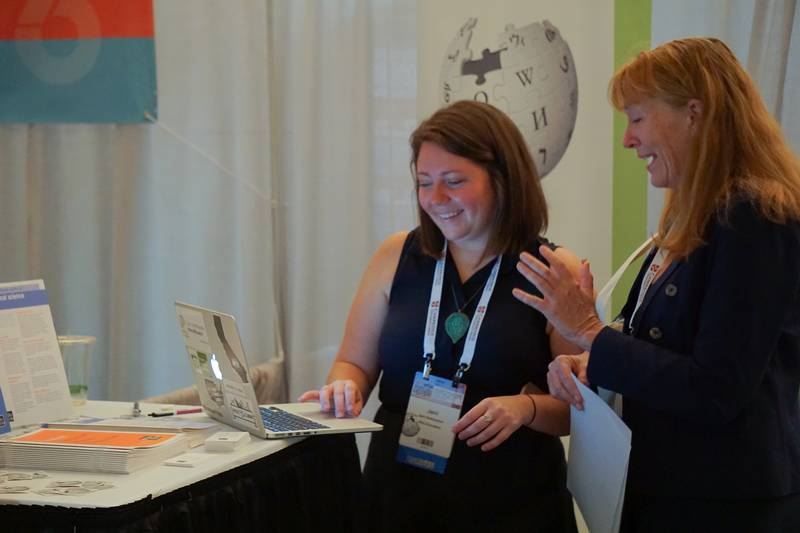 ASA and NCA are eager to encourage their members to participate in Wiki Education’s Classroom Program to increase the availability of information about American Studies and Communication from multiple perspectives on Wikipedia. Students edited 1,380 articles, created 4 new entries, and added about 210,000 words to Wikipedia. The Fall 2017 term is well-underway, and our students are beginning to dive into their Wikipedia assignments. They’re creating their user accounts, taking the training modules that will prepare them for their later contributions, and generally familiarizing themselves with a site they likely thought they knew well already. New courses are continuing to role in as schools on the quarter system begin their fall terms, and we’re even beginning to think forward toward Spring 2018. Continuing our efforts to provide our instructors with a variety of ways to connect with the Wiki Education team, we held two sessions of Office Hours earlier this month. During these sessions, instructors are invited to join members of the Classroom Program team through a video chat interface to ask any questions about their Wikipedia assignments. It’s also a unique opportunity for instructors to meet and interact with other instructors using Wikipedia in their courses. While we love the chance to share our expertise, it’s even more satisfying when instructors are able to advise one another on what works best for them. We’ll be holding Office Hours throughout the Fall term as students enter the different stages of their assignment. As always, we’re excited to see the range of contributions our students will make this term. With courses ranging from Behavioral Ecology to the History of Science in Latin America, we know our students will continue to fill in important content gaps on Wikipedia. Bonsignore’s Introduction to Information Science class is here to help! This person expanded the article’s coverage of Japanese religions, namely Shintoism and Buddhism. Now readers will be able to quickly find basic information about these religions in this article that will whip up their appetite to learn more. Who wouldn’t be fascinated to learn that the early Japanese were initially drawn more to Buddhism’s art, as it was hard for most to understand the religion’s difficult philosophical messages? Or that Shintoism was present in Japan before the country’s introduction to Buddhism in the 6th century C.E.? While we’re on the subject of Japanese culture, many may recognize the phrase “Gotta catch ’em all!” from the well-loved Pokémon franchise. This franchise isn’t limited to animated films, television, and video games, it also has its own trading card game where players can pit their own “pocket monsters”—or Pokémon—against those of other players. Another student from Bonsignore’s expanded the article on the trading card game to give more information on recent additions. The game’s popularity seems to be ever increasing and players of all ages can even participate in official tournaments held by the Pokémon Company International. Species articles provide a rich vein for students to create new articles or expand existing ones. And students in Jim Cohen’s Ecology class did just that. Alternanthera philoxeroides is an aquatic plant which is native to Argentina but has spread around the world, hitching a ride on cargo ships. A student in the class expanded the fairly short Wikipedia article, adding information about many of the impacts this invasive species has on vegetation, animals, and human activities. They expanded the article to look at some of the measures meant to control the spread of this species. Other students in the class created articles on other plant species—Verbena stricta, Tanacetum huronense, Platanthera hookeri and Halenia deflexa. Some took a different approach, creating a List of waterfalls of the Delaware Water Gap and an article about Genetic ecology. Yet others expanded existing articles. Image: Miniatur aus dem böhmischen Cantionale des Literaten-Chors in Chrudim, 1570.jpg, public domain, via Wikimedia Commons. Image: Artistic indoor pictures.jpg, by Nate Merrill, CC BY-SA 2.0, via Wikimedia Commons. Butterfly species also got a boost from students in Joan Strassmann’s Behavioral Ecology class. Although the class has just gotten started, students in the class have already made major expansions to the Grizzled skipper, Indian mealmoth, and Anthocharis cardamines articles. Two students in Ericka Menchen-Trevino’s Understanding Media uploaded images as part of their coursework. 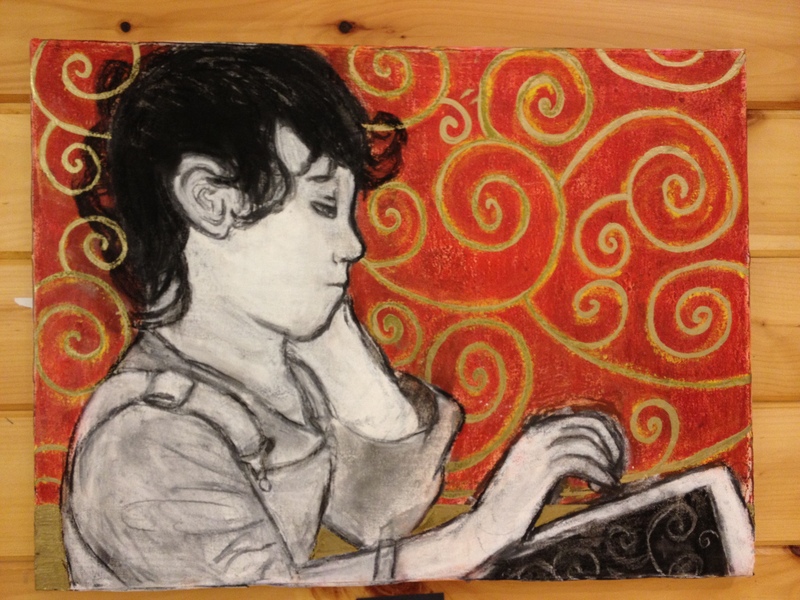 One added a freely licensed photo from Flickr, while another uploaded a brush drawing from the 1800s. Community Engagement Manager Ryan McGrady split his time between developing materials for the Future of Facts Wikipedia Fellows pilot program outlined in our Annual Plan and working with new Visiting Scholars, sponsors, and prospective sponsors at different stages of the onboarding process. Image: RockMagnetist.tif, by RockMagnetist, CC BY-SA 4.0, via Wikimedia Commons. 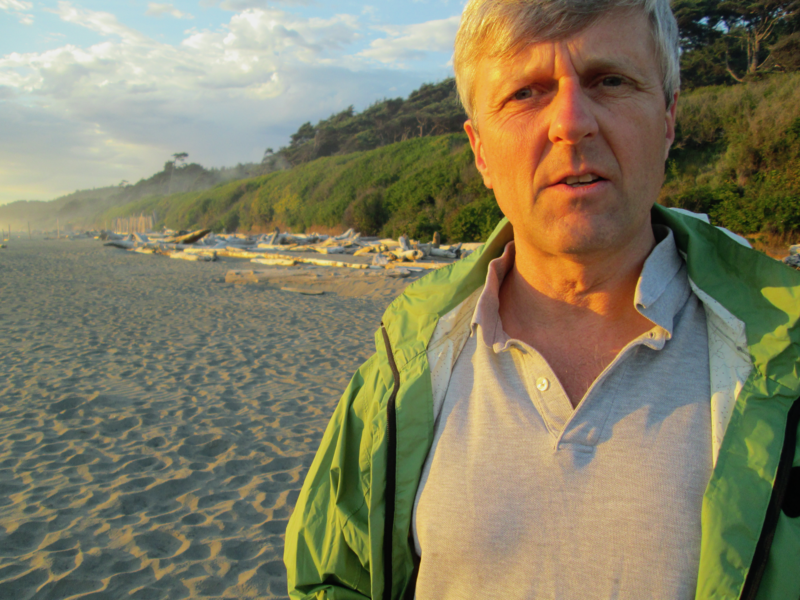 We were glad to announce a new Visiting Scholar, Andrew Newell, placed with the Deep Carbon Observatory (DCO). Andrew is an Associate Research Professor in the Marine, Earth, and Atmospheric Sciences department at North Carolina State University, specializing in rock magnetism. On Wikipedia, he edits as User:RockMagnetist, a long-time contributor and administrator. If you’ve read about geophysics-related subjects on Wikipedia, there’s a very good chance you could find his username somewhere in the articles’ edit histories. With the DCO, he will be developing Wikipedia’s coverage of topics relevant to deep carbon science. Read more about this collaboration in the announcement on our blog. Danielle Robichaud’s term as Visiting Scholar at McMaster University ended some months ago. One of the great examples of her contributions was the Canadian Indian residential school system article, which she continued to develop and shepherd through the Featured Article Candidates process. Now, the exceptional entry has finally been promoted as an example of Wikipedia’s finest articles. 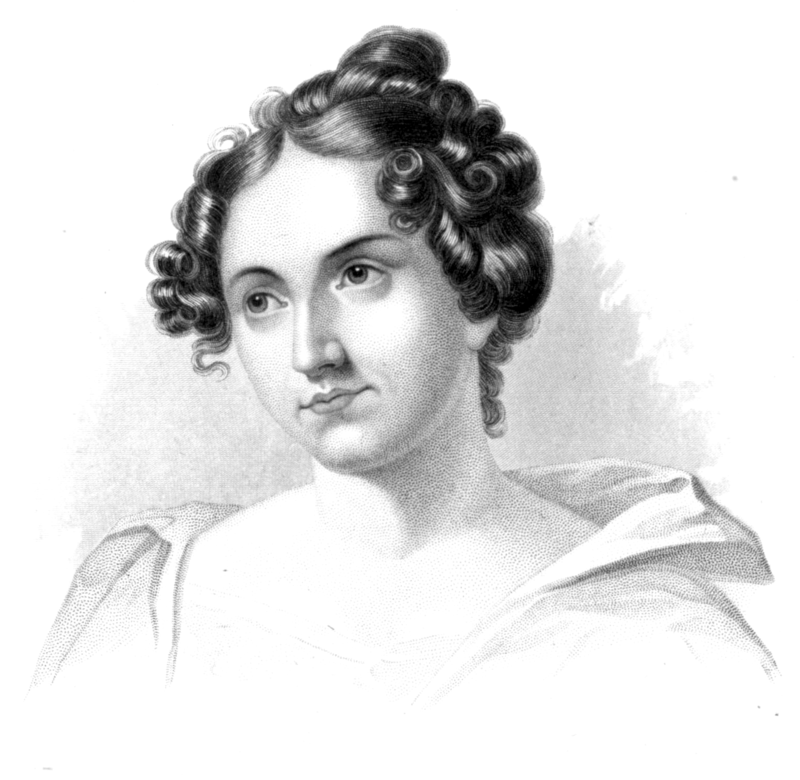 Image: Catherine Sedgwick (crop).png, public domain, via Wikimedia Commons. Rosie Stephenson-Goodknight, Visiting Scholar at Northeastern University, continued to improve Wikipedia’s coverage of women writers. Among others, this month she added Louisa Susannah Cheves McCord, Minnie S. Davis, and Catharine Sedgwick. We know that George Mason University Visiting Scholar Gary Greenbaum is a skilled Featured Article writer, but three promotions in a single month is a lot even for him. The WaterlooMedal, William Henry Harrison’s 1840 presidential campaign, and the British florin all joined the highest level of quality this month. 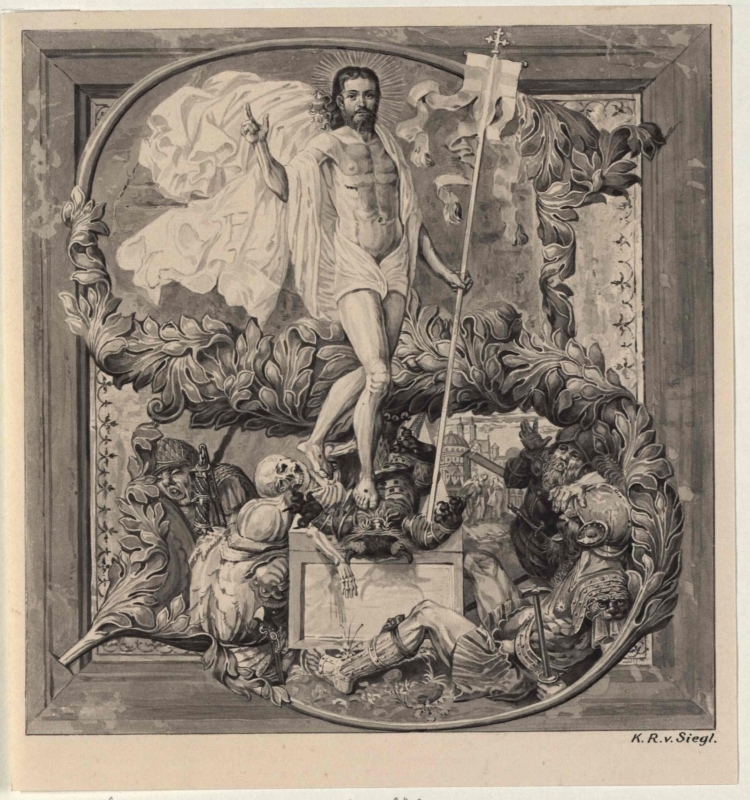 Finally, our newest Visiting Scholar, Paul Thomas at the University of Pennsylvania, whom we had not yet formally announced in September, hit the ground running with a Featured Article about the first century poem, Astronomica by Manilius. handout, Editing Wikipedia articles about History, which is available as both a PDF and in print for participating instructors. As part of our ongoing efforts to improve our help resources, we also updated the text of some of our online training modules for students. The main areas of Digital Infrastructure work in September were: exploratory data visualization of students’ impact on article quality; bringing our new Desk.com-based ticketing system into full-scale use; and improvements to the training system on the global Programs & Events Dashboard. We also saw an influx of first-time code contributors; the Dashboard codebase has now reached (and passed) the milestone of 50 different contributors. 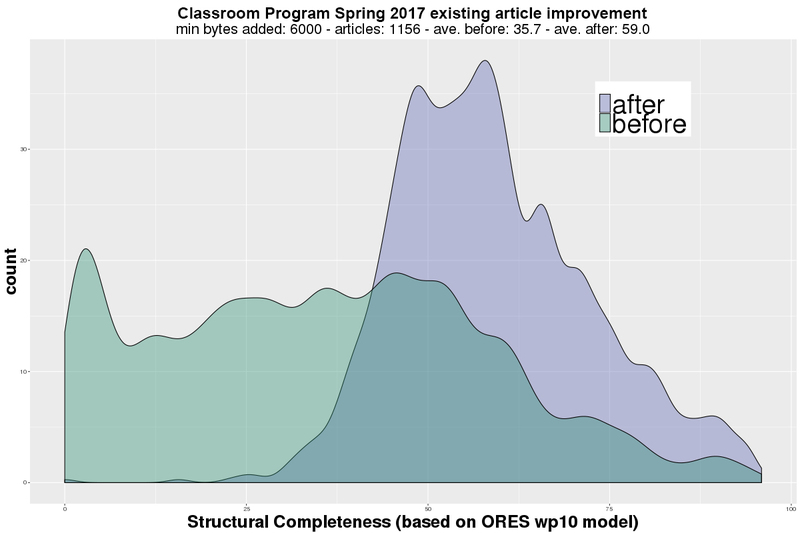 Structural completeness before-and-after Spring 2017, for the 1,156 already-existing articles that our students added at least 6,000 bytes of content to. The Dashboard can now produce similar graphs on demand for any set of courses. As part of our preparation for first Wikimedia Annual Plan Grant, we wanted to come up with a automatable metric that we could use to get at the quality — and not just the quantity — of our programs’ impacts on Wikipedia. We’ve been using what we call ‘structural completeness’, based on the ORES artificial intelligence system, to visualize the development of individual articles. This month, Product Manager Sage Ross took that ORES data and started organizing and plotting it at the scale of thousands of articles at once, visualizing the before-and-after distribution of article quality (according to ORES) for an entire term. As a result, the Dashboard now has a tool to build graphs of the impact of entire semesters. Sage also worked toward repeating Kevin Schiroo’s summer 2016 data science experiments, using data from more recent semesters. The Classroom Program team worked out most of the kinks with our new Desk.com-based ticketing system. It is now the default tool we use to respond to support requests and time-sensitive issues for current courses. Following up on a lot of excitement generated at Wikimania, Sage ported all the basic Programs & Events Dashboard training modules over to meta.wikimedia.org, which means that they can translated and updated on the wiki. Sage also overhauled the code for importing and updating this on-wiki training data, which was necessary to keep up with the increasing scale of modules and translations being created. For the Wiki Education training modules, Sage addressed one of the top requests from student feedback; the ‘Evaluating Articles & Sources’ module now includes a live on-wiki tutorial for newcomers to practice adding citations. For the month of September, expenses were $143,761 versus the approved budget of $172,420. The $28k variance can be attributed to some staffing vacancies ($10k) and less than anticipated spending on professional services ($6k), travel ($6k), and general operating expenses ($6k). Our year-to-date expenses of $442,050 are also less than our budgeted expenses of $537,758 by $95,700. Areas where our spending was significantly under budget include staffing ($16.4k), professional services ($41.8k), travel ($15.7k), and general operating expenses ($21.6k). relationships with funders who we felt might be interested in Wiki Education because of our work on the Future of Facts, Guided Editing, and Sustaining Science initiatives. We also began exploring funders that are interested in supporting journalism, as we understand journalism fairly broadly to include citizen-created/collaborative/non-credentialed type work, such as Wikipedia. We also submitted our first Annual Plan Grant to the Wikimedia Foundation’s Funds Dissemination Committee (FDC). The FDC is a volunteer group that determines large grants to support activities that further the mission of the Wikimedia movement. In September, Frank hired Özge Gündoğdu as Wiki Education’s new half-time Office Manager and Executive Assistant. Özge will help with everything that’s needed to ensure the smooth day- to-day operation of our office. She will also support Frank with organizing board and all-staff meetings. Frank also signed a contract with Denise Donovan who will provide financial services to Wiki Education on an hourly basis. Bill Gong, who was actively recruited for and accepted a position as Director of Finance and Business within UC Berkeley, agreed to stay on in an hourly position as Financial Advisor. Also in September, Frank worked closely with Director of Programs LiAnna Davis on finalizing the FDC Annual Plan Grant application.